Nessie LED Audio Light is a great spotlighting tool for your record cleaning machine or other audio equipment such as turntables. 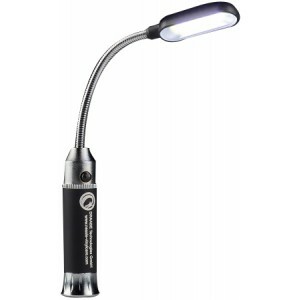 The spotlight makes working safer and ensures very atmospheric lighting in the evening. 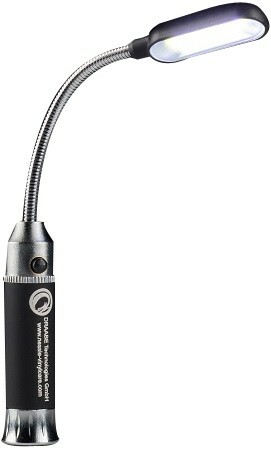 Nessie Audio Light is equipped with 7 high-power LEDs. The spotlight produces a pleasantly warm light. The cone of light can be swiveled. The spotlighting can be switched on and off via an integrated switch. The power supply is 4 LR44 batteries, which are easy to change. One set of batteries is included. Remove a screw cap on your machine. Place the attached magnet on the now exposed metal screw. The magnet is held securely by the magnet. Attach double-sided adhesive tape to the supplied magnet and position the magnet in the desired location on your audio device.